Finland: City Council of Outokumpu rules against helping elderly in favor of lone refugee family……. – The Tundra Tabloids……. Finland: City Council of Outokumpu rules against helping elderly in favor of lone refugee family……. The city of Outokumpu received 30 refugees in 2016. In this case, the refugee supivisorr worked on a full-time basis. According to current data, Outokumpu has only one family with a refugee background. – At its meeting on 7.1.2019, the Outokumpu City Council decided to continue using the half-day refugee supivisor’s services. This will cost the city EUR 20,000, writes Sanna Antikainen, an Outokumpu city councilor for the Finns Party, in her blog. A refugee supivisor directs one remaining family for a little over two working days a week. The city buys the service from Siun Sotel. The city’s 2019 budget has a 2.1 million deficit. 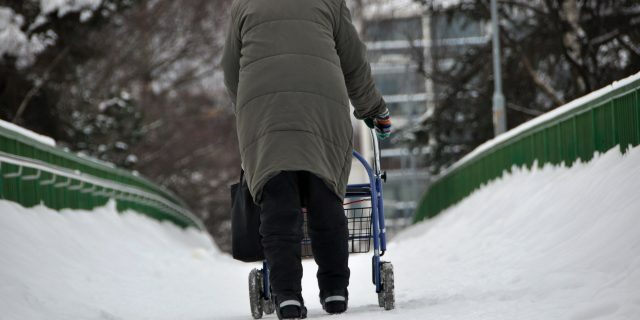 Referring to the deficit budget, the city did not offer its elderly people slippage-proof shoes. The anti-slip shoes would have cost € 40,000. – I made a proposal at the City Council meeting that the 20 000 euro appropriation and contract for the continued supervision of the refugee family should not be approved. It was rejected. – I think that after two years of individual supervision for one family it’s no longer needed. They are offered the same help as other people in Outokumpu. City hall’s decision-makers should remember that decision-making should be equal for all local people, ”says Antikainen. Previous Post Previous Post Manfred Gerstenfeld: The Multiple Distortion Categories of the Holocaust……. Next Post Next Post Finland’s YLE lets Sharia supremacist lecture Finns on Western meat production, “Biggest Crime in Human history”, two days after Holocaust memorial……. Multiculturalism is a gross failure. Assimilation, where celebrating one’s own heritage but as a full member of the dominant culture, wins. There Is No Such Thing As White Cultural Heritage. The West’s Legacy Is Open To All…. Still, is there something to it? Is there a common heritage that will cover El Greco and Hume and Dostoyevsky? Is there one that can include the Jacobites and the Jacobins? There is, but it is not racial, and white supremacists reject it because it rejects them. The unifying heritage of Europe is religious and philosophical. It is Jerusalem and Athens, in one famous formulation. Christian religion and Greek philosophy, filtered through Roman law and culture, are the foundation of European culture. The tensions, agreements, developments and settlements between these have shaped the Western world, and these roots of Western civilization are not congenial to white supremacy. Christianity is universal in its message and Jewish in its origins. For centuries after its founding, Christianity’s center was the Mediterranean world, including Asia Minor and North Africa. Christianity has never been defined by race, and locally-grown racist heresies are only sustainable among those ignorant of Christianity’s teachings, origins and history. Greek philosophy is likewise ill-suited to serve as a basis for white identity. It is either too universal (addressing the human condition in general) or too local—none of us live as citizens of an ancient Greek polis. Later philosophical developments in Europe, such as the philosophies of the Enlightenment, likewise tend to be too universal for white supremacists seeking a tribal identity. As for the scientific revolution that developed within Western culture (albeit with much borrowed from outside Europe), math doesn’t care what color someone is. (Indigenous Jews) Rare find: Coin with image of emperor who abolished Sanhedrin Students find a 1,600-year-old coin with the likeness of Byzantine Emperor Theodosius II, a first of its kind to be discovered in Israel. War is being waged against Western culture from within which is in essence a war against Christianity and its moral origins in the Hebrew Bible. By attacking these Biblical foundations in the name of reason and human rights, the culture warriors of secularism are sawing off the branch on which they sit. The only way to defend Western civilisation is to reaffirm and restore its Biblical foundations. My argument is a development of ideas I first explored in my 2012 book The World Turned Upside Down: The Global Battle over God, Truth and Power. We are living in an era which extols reason, science and human rights. These are said to be essential for progress, a civilised society and the betterment of humanity. Religion is said to be their antithesis, the source instead of superstitious mumbo-jumbo, oppression and backward-thinking. Some of this hostility is being driven by the perceived threat from Islamic terrorism and the Islamisation of Western culture. However, this animus against religion has far deeper roots and can be traced back to what is considered the birthplace of Western reason, the 18th-century Enlightenment. Actually, it goes back specifically to the French Enlightenment. In England and Scotland, the Enlightenment developed reason and political liberty within the framework of Biblical belief. In France, by contrast, anti-clericalism morphed into fundamental hostility to Christianity and to religion itself. “Ecrasez l’infame,” said Voltaire (crush infamy) — the infamy to which he referred being not just the Church but Christianity, which he wanted to replace with the religion of reason, virtue and liberty, “drawn from the bosom of nature”. But this Enlightenment did not remove religion so much as pervert it. It took millenarian fantasies, the idea that the perfection of the world was at hand, and it secularised them. Instead of God producing heaven on earth, it would be mankind which would bring that about. Reason would create the perfect society and “progress” was the process by which utopia would be attained. "Every devout Muslim is an "Islamist". Islam is not a personal religion. It is a religion of the public space. A "moderate" Muslim would have to reject Islam as a religion of the public space, as theocracy, and that secularism would be a rejection of Islam. Hamas urges UN to speed up transfer of Qatari money Hamas says efforts to funnel Qatari aid into Gaza is being stalled at the UN. Thousands of Arabs demonstrate along Gaza border Hamas says 46 people injured in weekly "March of the Return" protests. IDF aircraft attack two Hamas military posts. Iran showcases domestic fighter jets Iran showcases its domestically made fighter jets during a military parade marking National Army Day in Tehran. © 2019Tundra Tabloids.com. All Rights Reserved.